If you’ve ever been to Hong Kong, you’d know that the phrase ‘shop til you drop’ isn’t just a phrase, it’s a way of life. In Hong Kong, there’s no end to the dizzying array of international fashion labels available, but frankly, some shopping malls do it better than others. Check out Culture Trip’s guide to the city’s premier shopping hubs. One of the city’s first mega-malls, Times Square opened in 1994. Standing 16 storeys high, its designers were innovators of the ‘vertical shopping mall’ suited to spatially-challenged Hong Kong, deviating from the horizontal layout commonly found in Western countries. The building is now one of Causeway Bay’s most iconic, known for its large-scale exhibitions in its plaza and lobby. The mall features over 230 stores spanning mid-range to high-end brands. The more affordable labels include Zara and Topshop, while luxury shops include Louis Vuitton, Kenzo, a.testoni, Diesel and Calvin Klein. Numerous sportswear brands live on 7/F, while 8/F is known for electronics and watches. Conveniently, the Causeway Bay subway stop leads shoppers directly to the mall’s basement. For food, there are almost two dozen restaurants and cafés at varying price levels, most notably The Fat Pig by Michelin-starred chef Tom Aikens, not to mention the wealth of dining options in the mall’s immediate vicinity. This luxury shopping mall sits in the heart of Central. With over 800,000 square feet of space spanning four floors, the IFC mall is part of a larger complex that includes the Four Seasons Hotel, the Hong Kong Monetary Authority and some of the most exclusive office space in the city. 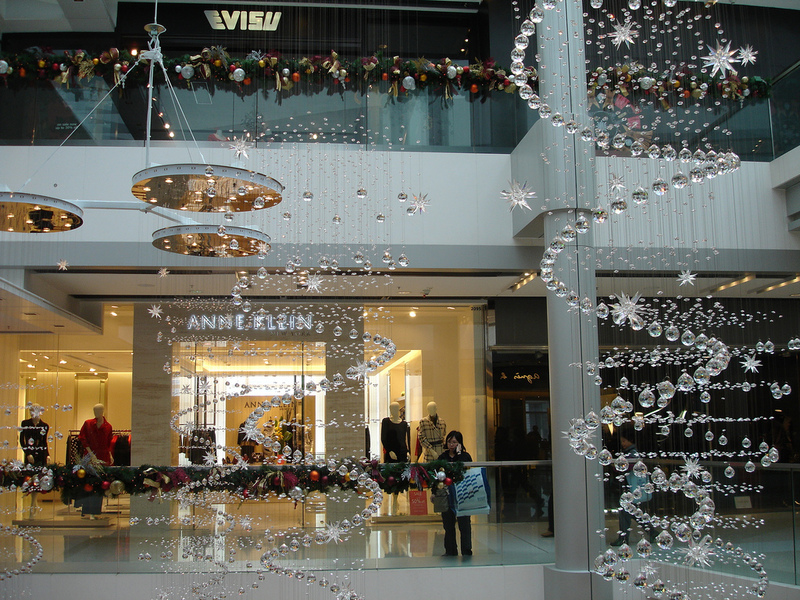 With over 200 shops, the mall offers a wealth of international brands such as Cartier, Bang and Olufsen, 3.1 Phillip Lim, Brooks Brothers, theory, and Emilio Pucci, as well as a movie theatre and a gym. In addition, the rooftop offers a gorgeous harbor view, so feel free to enjoy the public garden, or enjoy the multiple bars and restaurants up there. Last but not least, the IFC boasts over 45 dining options, including dessert houses, coffee shops, and multiple international cuisines. And don’t forget the two Michelin-starred restaurants located in the Four Seasons. Festival Walk is a major shopping mall in Kowloon Tong. Compared to most malls on Hong Kong Island, Festival Walk definitely has the edge in terms of space. The mall boasts over one million square feet of retail and dining space, as well as a three-level car park with room for over 800 vehicles. The elegant six-story atrium features a glass skylight, letting plenty of natural sunlight into the building. While there’s a decent number of high-end stores, Festival Walk is not quite as luxury-focused as some the other malls on this list. With stores like H&M, Aldo and Uniqlo, this mall caters to a range of budgets. One of the highlights of the mall is ‘The Glacier’, the largest indoor ice-skating rink in Hong Kong. Depending on the time of day, visitors can shell out either $70 or $80 for two hours on the ice. Additionally, Festival Walk offers a cinema, food court, and multiple coffee shops and restaurants. Located in the vibrant heart of Causeway Bay, Japanese-owned SOGO is the largest department store in Hong Kong and has been around since 1985. The building consists of 18 floors and spans 430,000 square feet of retail space, from the cosmetics brands on the ground floor up to spas and beauty centres at the very top. In-between you’ll find goods ranging from fashion, skin care, jewelry, and leather goods, not to mention children’s clothing and toys, bedding, appliances and stationery. Among the benefits of shopping in SOGO is its meticulous approach to signage and categorization – don’t be surprised to find floor signs with labels like ‘Ladies’ Lingerie & Nightwear’, ‘Golf Apparel and Gear’ or ‘Cigars and Smoking Accessories’. High-end European and Japanese brands feature prominently here, while the basement supermarket Freshmart serves as a one-stop shop for Japanese-brand groceries, confectionary, snacks and packaged food products. At two million square feet, Harbour City is hands-down the largest shopping mall in Hong Kong, stretching across a whole kilometer along the Tsim Sha Tsui waterfront. The complex consists of more than 450 shops, 50 restaurants, two cinemas, three hotels, 10 office buildings, a cruise ship and ferry terminal, and a private club. Shop categories span women and men’s fashion, beauty, electronics, accessories, sports, and kids. Expect to find international brands like D&G, Vivienne Tam, Versace, Hermes, Kate Spade, and more, as well as department stores like Lane Crawford, MUJI and Marks & Spencer. Dining options range from fine dining (China Tang, ÉPURE) to casual local chains like Café de Coral. Situated in Admiralty, Pacific Place is part of a complex connecting four luxury five-star hotels – the Conrad, the Shangri-la and JW Marriott, and the The Upper House. That should give you an idea of what kind of boutique shops are featured here. There are over 130 stores, mostly high-end brands such as Armani Exchange, Burberry, La Perla, Rebecca Minkoff and Tiffany & Co. However, there are some mid-range brands such as Nine West and Zara too. There’s also a 83,000 square foot Harvey Nichols, the luxury British department store’s first Asian flagship location. With easy access to multiple luxury hotels, the restaurant selection here is impressive. Inside the mall, you can grab casual bites like sandwiches and frozen yoghurt. And if you’re looking for a really fancy meal, you’re spoilt for choice: there’s the sophisticated contemporary European restaurant Café Gray Deluxe at the Upper House, sushi and cocktail bar KOKOMI near the Marriott, as well as sumptuous dim sum and Cantonese cuisine at the Conrad’s Golden Leaf. Lastly, Pacific Place also has a cinema, AMC Pacific Place. The six theaters are outfitted with leather seats and ample legroom, making for one of the comfiest movie-watching experiences in Hong Kong. This mall in Central features a wealth of high-end boutiques, including some that can’t be found elsewhere in Hong Kong, like the South African jeweler De Beers, cigar-maker Davidoff, and the exclusive gentlemen’s shoe store Tassels. 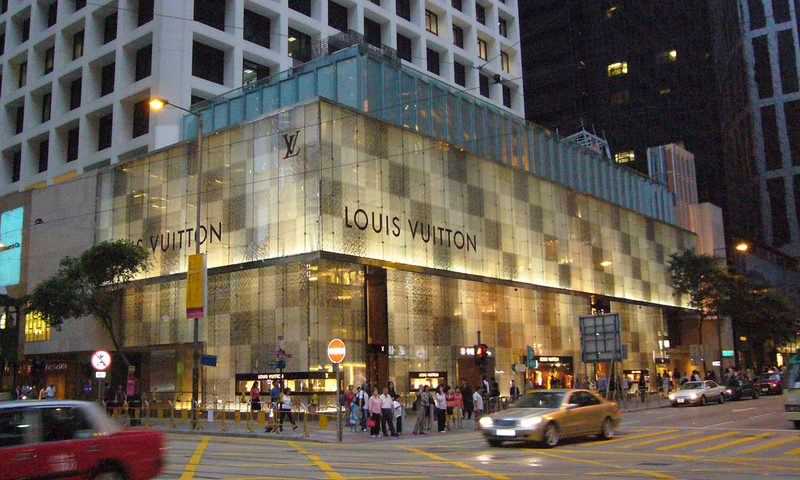 Other brands include Alexander McQueen, Jimmy Choo, Kenzo and Manolo Blahnik, while Louis Vuitton’s Asia flagship store sits comfortably on the ground floor. In addition, the Landmark is known for its high-end salons and spas, as well as being home to some of the world’s most exclusive international watch and jewelry brands – Chopard, IWC Schaffhausen, Lane Joaillier. It’s connected to the five-star hotel the Landmark Mandarin Oriental, one of the city’s most famous. That means multiple Michelin-starred restaurants are just steps away, including Amber, L’Atelier de Joël Robuchon and Otto e Mezzo Bombana.